The first race of the last round of the season of the Italian Formula 3 Championship and of the Italian Formula 3 European Series was won by the poleman Eddie Cheever that reduces his distance to the classification leader Riccardo Agostini. The JD Motorsport's driver is second ahead of the very good Mario Marasca (BVM). A contact at the start involved Maisano and Giovesi. 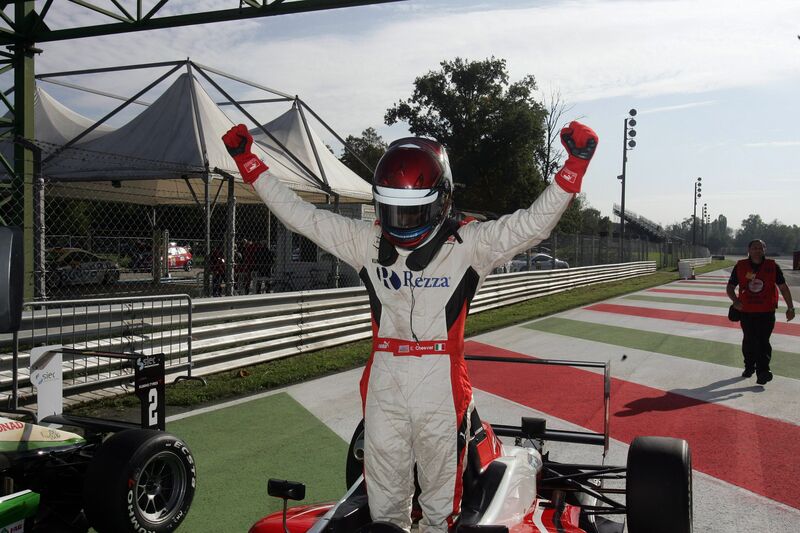 20/10/2012 - Eddie Cheever is again unbeatable at the speed temple of Monza. He stared from the pole position and took advantage of the contact at the start between his team mate Brandon Maisano and Kevin Giovesi. The Milanese driving for Ghinzani managed to be ahead at the entry of the first chicane but the Frenchman of Prema bumped him while breaking taking him out of the games. The pupil of Ferrari Driver Academy was forced to the pits to replace the nose of his Dallara but managed to get back on track even if a lap down. Eddie Cheever (Prema Powerteam) got the most out of the situation and took the lead ahead of Mario Marasca, Henrique Martins and Riccardo Agostini. The driver from Padova in force at JD Motorsport attacked the Brazilian of Prema on the outside of the Parabolica during lap five, Martins closed the door but at the first chicane Agostini took the rival. The counter-overtaking from Martins arrived at the Roggia while the Moscow driver of Euronova Sergey Sirotkin started to get closer to the two. During lap six Riccardo Agostini managed to get the third position moving an attack to Martins at the Roggia. Sirotkin also managed to pass Martins, but the Brazilian promptly recovered the fifth place. Agostini did not seem to be happy with third and put the hammer down getting in Mario Marasca's gearbox. The driver from Latina in force at team BVM could not do anything to stop the Mygale of the driver from Padova to get into his slipstream and pass him at the end of the straight taking to the Parabolica. Once in second place, Agostini did not have enough time to get closer to Eddie Cheever who produced a solid win at the Speed Temple of Monza. The third step of the podium went to Mario Marasca that was under the spotlight. Henrique Martins (Prema Powerteam) followed in fourth as he managed to keep at bay the Russian Sergey Sirotkin for the whole race. Sixth place for Yoshitaka Kuroda, who will start the sprint race that will end the championship tomorrow at 16.10 (GMT+2) from the pole position. The last two positions were obtained by Brandon Maisano (Prema Powerteam) and Nicholas Latifi (JD Motorsport), as the latter spun in the final stages of the race. Unlucky race for Robert Visoiu (Ghinzani), who was forced to the retirement after a contact with the JD Motorsport's Canadian. The title fight for the Italian and European titles is more open than ever now with Riccardo Agostini, Eddie Cheever and Brandon Maisano being the main protagonists but the Frenchman has a bigger gap to the top after the race run today. Race two will start tomorrow at 9.10 (GMT+2) with Eddie Cheever starting again from the pole position, with Kevin Giovesi on his side. At 16.10 green lights on the final race of the season. All the races of tomorrow will be live on Rai Sport 2 and web streaming on www.acisportitalia.it/F3.